My journey to world fare began on the south side of the 6500 block of El Cajon Blvd.—at the New Moon restaurant. I ordered the mu shu, my sister picked hot and sour soup and the evening concluded with a “Help! I’m a prisoner in a fortune-cookie factory” joke. We were back for more the following week. Such was the state of culinary adventurism back in the ’70s. That day and age is long gone. The New Moon is long since closed, as are most of San Diego’s Chinese restaurants of that time. Chop Suey / Peking Restaurant (2877 University Ave. in North Park) is one of the very few that remain. Chop Suey / Peking isn’t just old-school—it’s old. It opened in 1931, and inside its iconic facade is a restaurant essentially untouched by time. Chop suey is strips of pork and bits of egg, stir fried with bean sprouts, cabbage and celery and served with a cornstarch-thickened sauce. Served as a lunch special with fried rice and egg foo young, with the addition of noodles it becomes pork lo mein. It lacks the precise and layered flavors of “real” Chinese cuisine, yes, but the crunch of the bean sprouts and mouth feel of the sauce has its own appeal. The first wave of Chinese immigrants to the U.S.—essential for the construction of the railroads and other hard physical labor—arrived in the late 19th century. Other Cantonese immigrants set up “chow chow” restaurants to feed these workers. In 1882, though, the Chinese Exclusion Act brought an end to the flow of immigration and Chinese culinary skill and knowledge. By the mid-20th century, Chinese food in America revolved around a series of staple dishes that bore only a passing resemblance to genuine Chinese food. 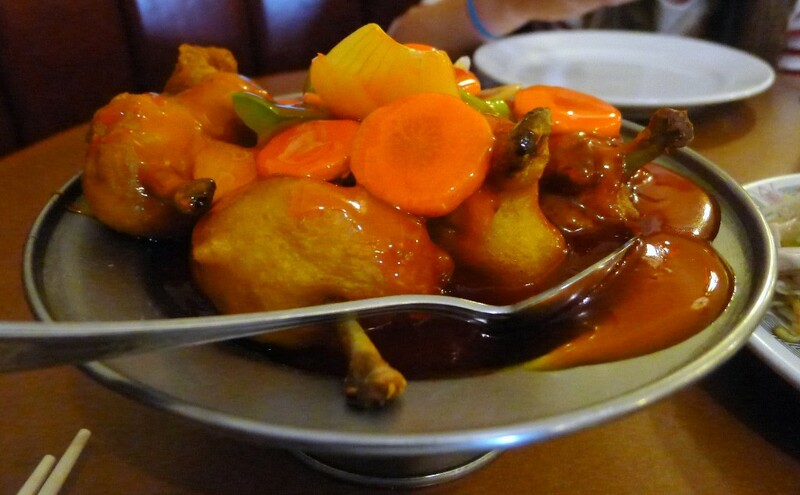 Chop Suey / Peking’s gotlet chicken is an example. This dish of deep-fried chicken wings, served with a dayglo-orange sweet-and-sour sauce, would be totally unknown in China. It was, though, precisely calculated to appeal to the taste buds of post-war America. The flavor profile of Chop Suey / Peking’s hot and sour soup might be a bit more familiar to Chinese nationals, but the texture would not. And yet that viscous quality is oddly soothing and strangely appealing.